A good Yorkshire pudding is a thing of beauty, whether you choose whether to make puffy individual puddings or go the traditional route and make one big one, which will be crisp around the edges but have more of the gorgeously custardy, squidgy middle. Although they are the classic shape these days, the round puddings were originally called 'Yorkshire puffs' and came about as a way of saving oven space: cooks simply dolloped spoonfuls of the batter around the roasting meat, directly into the hot fat. Quite why the batter pudding is associated with Yorkshire isn't clear, but the prefix 'Yorkshire' appears in the first written recipe of it, by Hannah Glasse in 1747, in her book, The Art of Cookery Plain and Simple. She seasoned the batter with ginger and grated nutmeg and cooked it below a joint of 'beef, mutton or a loin of veal'. 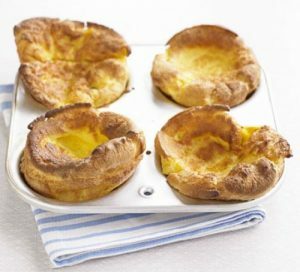 Whatever your preferred serving method, Yorkshire puddings can go wrong quite easily, so follow this foolproof guide – fit for the ultimate Sunday-roast spread. Step 1 Sift the flour into a bowl and make a well in the middle. Break in the eggs and add a pinch of salt (pepper too if you like, or even a dollop of wholegrain mustard) and a splash of the milk. Whisk the egg, gradually incorporating the flour, to make a smooth cream. Whisk in the rest of the milk. Step 2 If you have time, cover and let the mixture rest for an hour on the countertop or up to overnight in the fridge. Step 4 Heat the oven to 220C/Gas7. Step 5 Put the dripping or oil in one large tin or divide it between a tray for 12 muffins. Put it in the oven for ten minutes or so to get really hot. Step 6 Pour the batter into the tin (or tins) and return to the middle of the oven. Bake for 25 minutes, until very well risen and golden.